Blessed Homemaking: A Video You Will WANT Your Children to Watch! A Video You Will WANT Your Children to Watch! I am not big on letting my children watch videos. I am picky about what I allow them to watch. A big reason for this is that I know they will repeat what they've heard (and sometimes seen), and they'll replay it in their heads, over and over. There are not a whole lot of decent videos out there, in my opinion. I also don't like them sitting around mindlessly tuned out to something on the screen. This video is the latest DVD from Moore Family Films--ABC Say It With Me. I really, really enjoyed this video, and I was so glad that the Moores sent it to me to review. My children, even though I limit their video-watching time, still like to request to watch a video more often than I'd like. And boy, were they thrilled when I told them I had a new video from The Moores to watch. They excitedly sat down in front of the TV to watch ABC Say It With Me. This video is a blessing. We see the Moore family again, with all of their sweet children. This video will help your children to memorize Scripture--what an important thing to have our children do! Psalm 119:11 says, “Thy Word have I hid in mine heart, that I might not sin against Thee.” As parents, it’s important to teach our children both to memorize God’s Word and to be “doers” of the Word by obeying it. 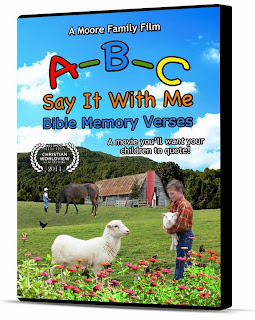 In this film, a KJV verse is taught for each letter of the Bible. The verse is repeated several times while a scene is shown that illustrates something related to the Bible verse to be memorized, while children are reminded to "Say it with me". The illustrative scene helps to teach good character to your children. For example, the "C" memory verse is "Children obey your parents in the Lord: for this is right. Ephesians 6:1" We see a group of children outside playing a game. The mama calls them in to eat, and instead of complaining and whining to stay out longer, the children get up to go inside, while we hear a cheerful reminder to obey quickly. This video is not loud or obnoxious--it has pleasant music and sound affects, and farm animals! (You can't go wrong with that!) I enjoy watching it with my children, and it even helps me to memorize Scripture! Would you rather have your children repeating some nonsense or not-so-good stuff, or repeating Scripture? I know what I prefer! And I think it will bless the Lord to hear our little ones going around reciting His Word. So, this video is on my, "Yes, you can watch that!" list. It is on the top! It helps them to hide God's Word in their hearts in a cheerful, upbeat way and gives them good examples of loving one another and also shows pleasant family life. You can watch some samples here! Make sure you follow the directions on the Rafflecopter form. You MUST visit Moore Family Films, look at their other videos, and leave a comment here telling me which other video you would like to have. If you do not do this, you will be disqualified from winning. You may also do other things to gain additional entries, as listed on the Rafflecopter form. All entries will be checked and verified. My children would love this! We have Children Are a Blessing but all of the videos look great. We need some more! Love this great way to teach scripture memory. What a great teaching tool!! It is Your Life - The Moss Family looks like a good one to watch. Ohhh, I'd love this dvd for my children! I am very picky about what they watch, when they do watch movies. I adore Scripture set to song as it is makes it so much easier to remember ... thank you for hosting the giveaway. I'd love to watch any of the Moore family films - they all look so wholesome!